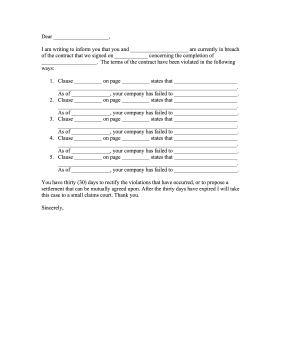 If a contract has been breached, the wronged party can fill in the blanks and file this contract complaint letter. 1. Clause __________ on page __________ states that _______________________ _________________________________________________________________. As of ______________, your company has failed to _______________________. 2. Clause __________ on page __________ states that _______________________ _________________________________________________________________. As of ______________, your company has failed to _______________________. 3. Clause __________ on page __________ states that _______________________ _________________________________________________________________. As of ______________, your company has failed to _______________________. 4. Clause __________ on page __________ states that _______________________ _________________________________________________________________. As of ______________, your company has failed to _______________________. 5. Clause __________ on page __________ states that _______________________ _________________________________________________________________. As of ______________, your company has failed to _______________________. You have thirty (30) days to rectify the violations that have occurred, or to propose a settlement that can be mutually agreed upon. After the thirty days have expired I will take this case to a small claims court. Thank you.